Fourth Bible printed in German. Fourteen Bibles in High German and four in Low German were printed before Martin Luther's translation of the New Testament. This is one of the earliest editions, produced almost at the same time, but probably slightly later than Günther Zainer's German Bible, which is rather datable to 1474. 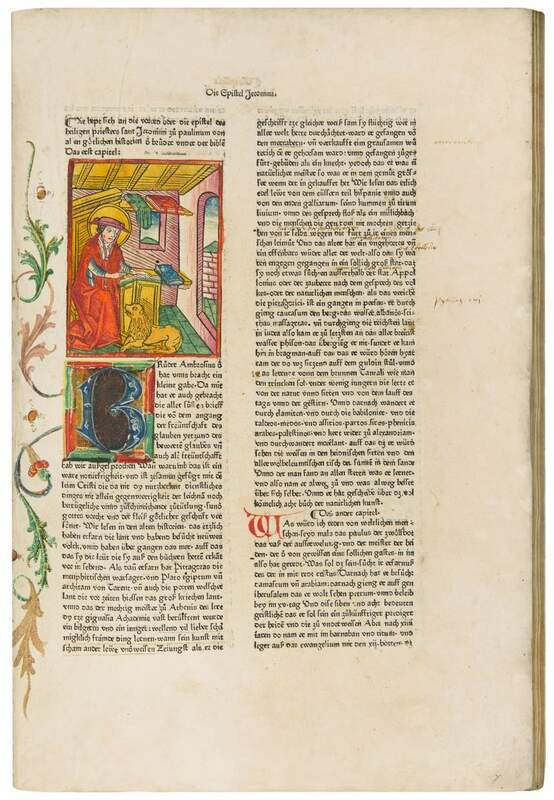 Much more important are the woodcuts: These two printings were the first illustrated German Bibles. While Zainer used historiated initials, Pflanzmann employed for the first time independent illustrations in a vernacular Bible, even though he placed the column-wide woodcuts at the beginnings of books and prefaces. The illustration of the present copy is enhanced with bright, contemporary, probably Augsburg colouring. Jodocus Pflanzmann was notary and procurator at the clerical law court. Additionally, he ran his small press producing mainly small publications, such as indulgences, from which the Bible edition deviates considerably; it is one of his earliest printings and definitely his most important work.